I participated in a campaign on behalf of Millennial Central for Seventh Generation. I received a promotional item and product samples as a thank you for participating. Off and on I like to blog about measures we take in our family to help reduce our carbon footprint and try to be earth friendly. I continue to believe that small measures like reusable grocery bags, cloth diapering, and recycling can make a huge difference when people join in as a united front. 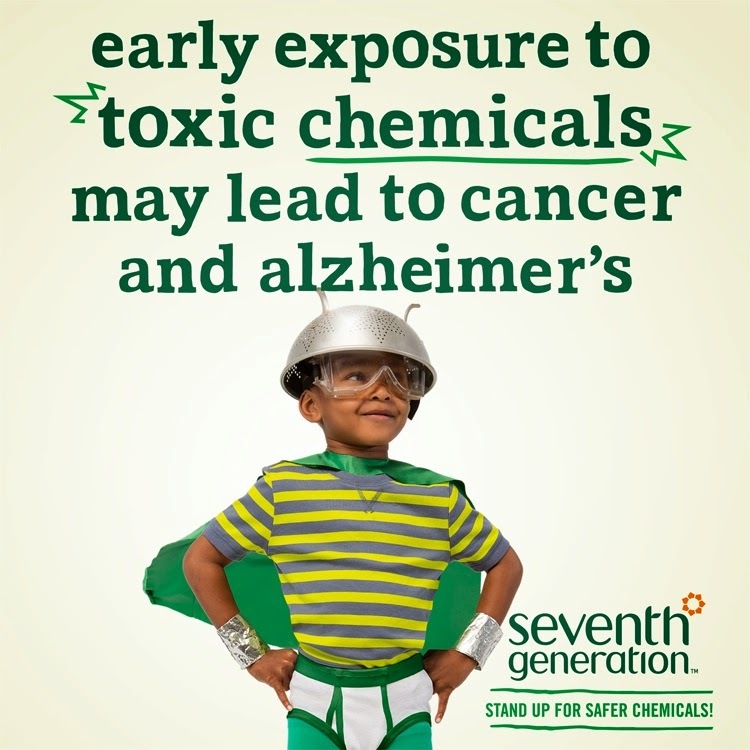 I've teamed up with Seventh Generation to help spread awareness for chemical reform. The Toxic Substances Control Act was introduced in 1976, and it hasn't been reevaluated since then. The need for reform is strong - more than 80,000 synthetic chemicals have been introduced since the act passed in 1976, but only 10% of those chemicals have been tested by the EPA. We know that toxic chemicals pose many health risks - Alzheimers, learning disabilities, and asthma just to name a few. I have asthma, as does one of my children, and I know from experience that chemicals can be triggers for breathing problems in both of us. I know I'd love to feel safer about the products I use in my own home. We try to avoid chemicals when possible, being careful to garden without pesticides and using green cleaning products like natural laundry detergent and dishwashing soap. But there are times when I'm unsure about a product, and I'd love to have more information available before I use it in my home. It's crucial that this major environmental law be updated so that chemicals are subject to testing and disclosure is in place for consumers. Wouldn't you love to see a day when all cleaning products had a disclosure label, so you knew exactly what you were spraying on your rugs or on your windows? You can help! Seventh Generation has a goal of collecting 100,000 signatures by April 24th. Take a moment to click on the badge below and sign the petition. My name is already on the petition - I feel it is so important that we protect our families (and our pets) from sketchy chemicals. If this is an issue you feel passionate about, you can also check out the #FightToxins Twitter party on April 10th at 1:00 pm. You will find tips about living a health green lifestyle, and earth friendly cleaning products without a lot of chemicals. Seventh Generation is a company that has worked for 25 years to create plant derived products using bio-based ingredients that contribute to healthier home environments. This is such a great idea, and I'll be signing that petition myself! Along with using products which touch the earth lightly, we make as many of our own cleaning products as we can from gentle, organic ingredients. Heel goed om dit eens flink onder de aandacht te brengen. Petition signed. We do not have recycling in our town, which should be remedied. We have to take our recyclables to the bins in the Walmart parking lot in the next county. We also use reusable grocery bags. Good post! High Five to Seventh Generation ! Very informative post. I guess we should all stop and think a bit more about what products we clean with. Scary what is out there that we are not always aware of. Great post Lisa. For those considering cloth vs disposables in diapers, do your research. It's nowhere near as cut 'n dried as you may think. For several years now we've been recycling and using cloth bags for groceries. The checkers always say how much better they are than plastic and don't understand why more people don't use them. We do reuse the plastic grocery bags. I'll sign the petition. Lisa, thank you for bringing important issues to our attention. I do like using Seventh Generation products. i am heading over now to sign the petition. Well, we like Method, but I guess this is really good too. Great post! It is something I have been thinking about for some time now, trying to get rid of all the toxic cleaning products and using more green ones. I also am buying more and more organic foods and just hoping that one small step doing this will lead to better health for all of us. Signed. Their little mask is cute! I try to stay low-toxin because I have sensitive skin and lungs. I try to recycle as much as I can and use as little electricity as i can. Two of my grands have super sensitive skin and asthma...kudos to Seventh Generation. This is a message I'm happy to get behind!